I could bore you by telling you I've been crazy busy lately. That I haven't had time to do anything other than eat, sleep, and work. And eat plenty of Subway $2 subs. And the occasional store bought cookie. And comsume large doses of coffee. And put sunglasses on Lilo. And wonder why my couch looks green/yellow in cell phone pictures when it's really white, but not care enough to do anything about it. But other than that I've had no time. So I'll just ask you something. What is the best gift you've ever received? Or if you've never received anything good, what's the best gift you've ever given? Or if you've never giving anything, just tell me your hair color. *Facebook it, blog it, tweet it, pin it for extra entries. Please leave additional comments for each of these. This time of year is crazy! I feel your pain! I soooooo feel your pain!!!! I have been sick since before Thanksgiving and I am getting very stressed over the holidays as I have NOTHING done. Aww, I feel your pain too. the best gift if i've ever received is a clunky locket bracelet my boyfriend gave me with our picture in the locket. it always makes me smile whenever i see it and wear it. The best gifts I have gotten have been homemade. Can't beat something that was made just for you! My husband,children and granddaughter are always the BEST gifts I've received. And I would have to say the next one would be when I won a trip to Sydney, Australia, in 2007. Best gift I got was my dog minnie. I woke up to her with a big bow around her neck. Sweetest thing ever! The best gift was from my sweet sister when we were both still single. She gave me a trip to Hawaii, escorted by none other than...HER! We had a blast. We ended up in a tour group with lots of people from Minnesota, and ended up coming home with a MinneSOta accent! The best gift came the first Christmas after my Mom passed away. My husband went through her cedar chest, picked a couple old photos of her, and her and me together. He copied and framed them. When I opened them Christmas morning I cried and heard him say "I did good this year." YES he did! One of the best gifts I've given was surprising my dad, a Nascar fan, with tix to his first live race for his 60th. He was so surprised & excited! My husband gave me a necklace with a camera charm on it when we first started dating, it was so thoughtful and sweet. This year, I gave my husband a child for Christmas. It was 4 months before Christmas but hey, it's the thought that counts, right?! A couple years ago I had never seen my husband without a mustache ever & for Christmas he shaved it off. I loved it & he looked so much younger! It didn't cost anything & it was the best gift I have ever gotten. I know it was very hard for him to do he had had it since hs. I am not sure what the best gift I have recieved is but the best one I have given was a keychain from the Rusted Chain that said "I love you more". The person I gave it to LOVES it! The best gift I ever received was the Christmas I had my twins!! My friends knew I was super busy so they gave me the gift of time...for myself! To do whatever whenever and they would babysit or do errands...that was my favorite gift and I really loved and appreciated them for thinking outside the box! My sweet husband, realizing he could never pay the "housewife" what she's worth, buys awesome gifts. One year it was diamond earrings. While I enjoy those, my absolute favorite is my three stone opal and diamond ring he got me a few years ago for V-day. He's a keeper, that's for sure! One of the best gifts I have received is probably the handmade fall leaf art my brother made me. The best gift I've ever received was The Biggest Loser Weight Loss Yoga & Boot Camp DVDs. it helped me on my way to lose 50 lbs! My favorite gift was my engagement ring ... my hubby proposed a few days before Christmas, on one knee, in the snow. It was beautiful! Well,my hair color is black and well gifts, I love when I get gift cards! the best gift i ever got...my oldest daughter. i needed her so badly at that time in my life. then i was blessed with another daughter and a son...all wonderful gifts! Best gift I ever gave Lazy Dad was for fathers day several years ago. I bought him one stock in his favorite company. oh, and my hair color is Brown. not poop Brown. more honey Brown. I have received some really pretty jewelry from the hubs but the best gift he gave me was my sewing machine! I love it! Best gift is tough to answer. I love gifts in general:) Though I really love the scarf one of my best friends knitted for me! My husband surprised me with an Ipod touch last year for Christmas. Earlier this year, he surprised me by letting me book a trip to Disney World and then a Disney Cruise. We are also going to Disneyland the day after Christmas. I really don't care if I don't get anything under the tree this year. would love to win!!! best gift ever: my engagement ring. i love it so much!! from the heart drawings and hugs and kisses from my little girls. One of the best gifts I;ve given was an old photo of my mom and aunt (they are twins) when they were very young..I had it matted and framed and it was just an awesome picture of the two of them!! So last year I gave my husband a Be the Chef gift at Benihana. He loved it and we all got some great food! Thes best gift I ever gave is also the best one I ever received. We gave my uncle a puppy for Christmas. He had lost his wife and then more recently his dog. He lived out of state but we knew he was coming to our house on Christmas. Well, he said he already had a dog being shipped to him and he didn't take the puppy we found for him SO we got to keep her. So glad he didn't keep her. My best gift is from this year...and it came early (last weekend). My husband finally realized himself and admitted that he has a drinking problem. He is getting help and is on the road to recovery!!! I have waited a long time for this and am SO excited for what the future now holds for him and our family!!! My best gift receiving memory as kids every Christmas at Grandmas in our stocking would be a large size coloring book and a new box of crayola crayons. Best memorable giving was when we stayed up until 3am helping Santa replace our teeny tree with a really huge new one. To surprise my son when he was six who is now twenty two. The best gift I ever received was the year I got married my sweet husband bought me a 1 karat sapphire pendant with 3 diamonds around it. He picked it out all by himself and even ran around the whole town trying to find a glittery box to put it in because he knows how much I love glitter and him! Best gift I ever received was my Husband coming home from Iraq. Truly amamzing!! My oldest daughter on her first Christmas gave me a cameo necklace that was a mother and child. on the back was engraved with "Answered prayer." I know it sounds shallow, but my husband gave me a 5 hour spa appointment this year for our anniversary. Best. Gift. Ever. Thanks for the great giveaway a cute dog!!! I am making my son a quilt this year out of some of the shirts he wore his first year. I am really excited about it and the meaning it has to both of us. I can't wait to finish it and give it to him at Christmas. Life is hectic and stressful this time of year. I feel ya! The best Christmas gift ever was the old desk my dad refinished for me when I was a kid... it had been his mom's and I will keep it forever! i stink at getting gifts (i have great ideas but never have the money to buy them). but my hair color is brown, so there's that. My engagement ring in my Easter basket 13 years ago! Best gift would have to be my laptop I got last year for Christmas! Totally relate, and love the fact that I'm entering to win a bit of...nothing! The best prize I ever received was a Barbie Dream House! Oh wait, that was my sister's... one can always dream. hmmm, best gift in recent years. my kindle. I love to read and hate to shop for books, so this was absolutely perfect! Not sure if they were the best gift but a gift I have really appreciated are the Ugg boots I got last Christmas. Comfy and warm. My Mac laptop was a pretty awesome gift. I fell upon your site thru an etsy recommendation and love it! so cute! Hmm..I can't think of some great gifts at the moment. :) It's late. :P Oh, and I have dark brown hair. The best gift I received was a surprise visit from our son and Mom for Christmas- we had moved out of state and not able to get back home so they came to us! The best gift I every got-my son, 12 days early. The best gift I've ever received was my engagement ring on Christmas Eve, 22 years ago! I would love a $2 subway sub right now!!! stuck out in the country without a car. So my hair is brown, one of the best gifts i've ever got was a vintage locket from WW1. my husband found it , got it polished up and put a picture of us inside. It had a tiny little crest on it with the name of the country where the soldier was. I can only imagine the memories. The husband knows i'm a sucker for vintage! Best gift? My camera. It's the most recent best gift...my hubs is good to me. Ive been trying for a while to win...maybe this time!!! Years ago, I wanted a goat, yes a goat and on Christmas Day we visited a farm and a new born kid was placed in my arms while my parents said "Merry Christmas"
One Christmas, I found out I was pregnant on Christmas Eve. A wonderful, wonderful gift he is! I can't think of a best present right now, but my hair is brown! Your dog is adorable! The best gift vie ever received was myNikon D40! The best gift I have ever received was having my son on my Birthday. I don't think that one can be topped! Hey, we're all a little dazed & confused this time of year. My hair is gray (now) but it USED to be just plain ole brown. The best Christmas gift I ever received was my first sewing machine from my parents when I was 16 -- still have it, more than 45 years later. Best gift I have ever received... oh shucks that's too hard. My family is very good at thoughtful gifts. and/or practical. One year I got a diamond bracelet AND a handgun. Pretty sure the second one was actually a gift for my husband, but disguised as a gift for his wife :) This year I actually put a necklace from Rusted Chain on my list, so hoping my mom put in an order! best gift? too many, hard to decide. so i'll do the hair bit - dark brown with some grey. oh yes, it's such a busy, busy, busy time of year. The best gift ever was my brand new sewing machine my hubby bought a few weeks ago...few days after that a brand new 17inch Toshiba laptop! best gifts ever! Gift of salvation....something I don't deserve! My Cabbage Patch Kid Della, when I was about 4. It's the first real memory I have too! The best gift I've ever received is my Kitchen Aid stand mixer. It's definitely been the gift I've used the most. I love finding great deals and the perfect present for people.... so fun! 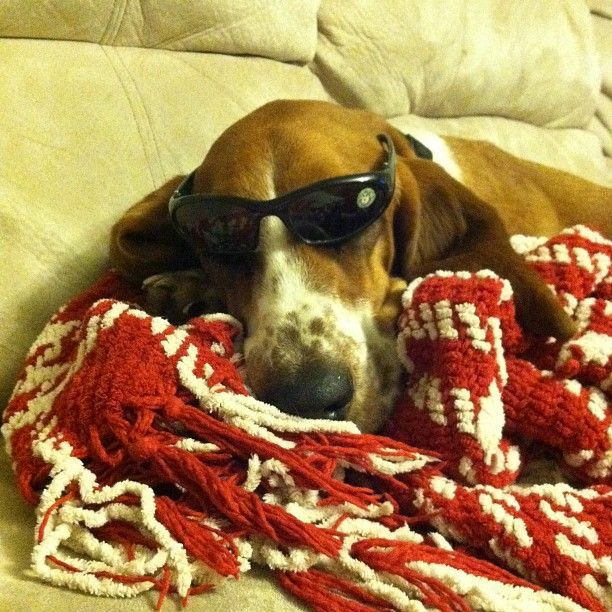 Love the dog with sunglasses. I gave my husband a book of family pictures last year that he really liked. Last year my dad gave me a TIP book. We saw it at the flea market and I commented how I loved that book when I was in first grade. He went back and got it! It was super special because it came from HIM. Merry Christmas! The gift of hope from knowing Jesus! My daughter a few years back. It's too hard to decide what my favorite gift is. So I'll tell you that my hair is brown with a natural red undertone. And I'll also tell you that your doggie is too cute!! I saw this pic when you posted on twitter and it made me just smile! Keep up the good work! We saw a very beautiful music box in Colorado when we were engaged...my hubby called the store the next Christmas and had it shipped. What a surprise when I opened the box! He always comes up with great gifts that make me cry! Best gift I've ever received was my yellow lab Lucky! I gave my grandma a scrapbook I made in highschool! It was one of her favorite gifts! Kinda cheesy, but so far my best Christmas gift has been my graduation! I completed my undergraduate degree this month and it's amazing. The best gifts are ones you don't ask for, but are exactly what you didn't know you wanted. Best gift gotten...a family mini-vacation promise for later in the year. It usually comes in the form of a gift certificate to someplace cloes but that we've never been all together. And the 3 couples that make up our big family all go together for a weekend. The time we share is the best gift ever. The Greatest gift I ever received is my kids! What a wonderful gift from the Lord. Just having my family together. Hands down my Kitchen Aid stand mixer. Wanted one for years. Love it so much! p.s. I love those $2.00 subs too! A diamond necklace from my husband when we were dating. Best gift - a family necklace with a mom, dad & 3 kids encircled with a heart. I love it. The best gift my husband ever got was me!!!! Well, would ya look at this? I kinda feel into this wonderful giveaway from the post above. Please don't worry, I didn't break anything. Heeheehhee! Oops...my bad. Is my blonde showin'??? The best gift had to be the box of hay I had under the tree. My heart was broken 'cause my only little girl desire was a Thumbelina Doll. I took the box of hay out on the porch and began to toss it out in the yard when I discovered a beautifully wrapped package which contained my wonderful baby doll! Whew...am I long winded or what??? Best Christmas gift 8 yrs. ago = my husband asking for my hand in marriage. LOVE him! Its hookey but the best gift I got was from my son when he was in kindergarten. His teacher has the kids paint poinettias and then she shrunk the painting and put them on greeting cards. I have the original painting and got to share his art with my family. Best Christmas gift ever? My youngest daughter last year a couple weeks before Christmas. My only winter baby, and believe me, she is WILD!